I have another confession to make and it is one that I have made freely to people but I don't think I've really talked about it here. I'm afraid of statistics. I know that is a common fear but it is one that has kept me out of my professional/educational path for a long time. See I have two Masters degrees. When people hear that they are always so impress or think I'm crazy but the reason I have two Masters degrees is statistics. Rather than face the challange of learning statistics, which I knew I would need for a doctorate, I took the easy way out and earned another Masters degree. It's a bit crazy. Fear is a bit crazy in general. Why talk about this now? Well it has come to a head. I have declared myself for the Research and Evaluation cognate for my doctorate in Ed leadership which means statistics! I'm terrified. I'm in a catch-22 at the moment. I have no background in statistics but I'm too advanced in my studies for an elementary stats class. As a fellow doctoral student told me, "You are too smart. They teach to the lowest person in the class. You'll be bored and feel like you've wasted your money." I know she's right but I'm just so afraid since I'm already coming in behind. I've decided to work my way through the elementary statistics book so that I can get a foundation in stats and then I'll be jumping into the deep end of the pool with a stats class at the Masters level. I already said I was scare right? 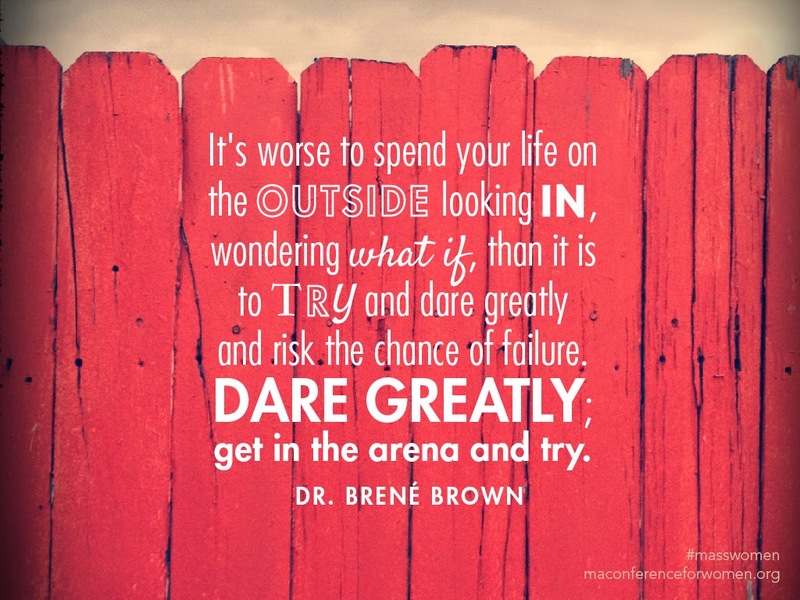 If I am going to dare greatly then I have to risk failing. I don't want to take the easy way out and just choose curriculum and instruction for my cognate. I want to be a researcher and statistic just can't get the better of me. I think that would be my deathbed regret if I don't go for it. I never tried to learn statistics and go for my real dream of being a researcher. I don't want to chicken out. I want to stand strong and maybe fail in a huge way going for my dreams. So I'm daring greatly. I'm entering the arena. Courage or comfort, never both, right?